I once read in an article in a science magazine, by Deadalus (if I remember the name correct), that in theory sounds are hidden in paintings. The brushes, that people like Rembrandt or Van Gogh have used, must have worked as a primitive recording equipment. Sounds, that were audible at the moment of painting, or even voices of the painters, must have been recorded in the paint. The problem is of course that we have not yet any idea how to get these sounds out of the paintings. I love ideas like these. To me they are not absurd, but eye openers. My mind tends to close and to produce thoughts about things that are not possible. I don’t want that, but it happens. I love it when people tell me about ways to make things possible that are considered impossible, even if it is only in theory. Yesterday’s story about the phonautogram is a good example that we can never know what is possible and what not. Most inventions start as an idea that is considered impossible by most people. I like to believe that nothing that we can imagine is impossible. Imagination is the key. I think it would be a good idea to teach ”Imagination” in schools. Of course, with our head in the sky, we have to keep our feet on the ground. The world is already full enough with peope that cannot distuingish reality from phantasy. But it seems to me that imagination is highly underrated in our culture. Imagination is closely related to magic. In our present culture magic is considered Disny-nonsense by most people, but I think that magic is basically just how Aleister Crowley defined it: magic is the craft to let things happen in according to one’s will. Magic is what happens, while logic is what we think that will happen. Things rarely happen according to our will. People think so, but that is very strange, because if it was true, we could predict the future. But nobody can even tell what will happen the next minute. Nor even what he or she will say or think the next minute!!! We are being brainwashed with ridiculous ideas about Life and the World. It is very difficult to keep an open mind in a society like ours. In my music collection are only a few items that deal with these subjects. 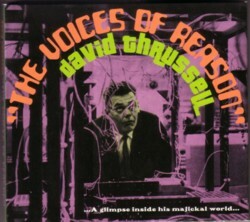 One of the best is a CD by David Thrussell, ”The voice of reason” , released in 2001 on Ant-Zen. David Thrussell has released many many recordings, and is known as an electronic musician, but I only know this one CD that I bought in 2001. Part (not all) of our educational system and mainly the media seem to be designed to kill imagination within children rather than encouriging to develop it. I hate to say this as a music teacher, but a lot of my collegues are in fact teaching their pupils nòt to develop their imagination. Old musical rules are more important. decided to stay a littlle younger. One of the others even started to create music that went far beyond what I had taught her. That was a very rewarding experience.